There are many ways to find free reclaimed lumber. If you know where to look, you can find salvaged timbers that are free for the taking. Here are a few ways to get the free recycled wood you are looking for. Old barns and mills are a great source for high quality virgin timber. Many are long past their prime and have begin falling apart or the owners are in the middle of tearing it down. Most barn owners will happily give you there old dilapidated barn just to get it out of the way and cleaned up. You may be surprised by the volume of calls you receive. 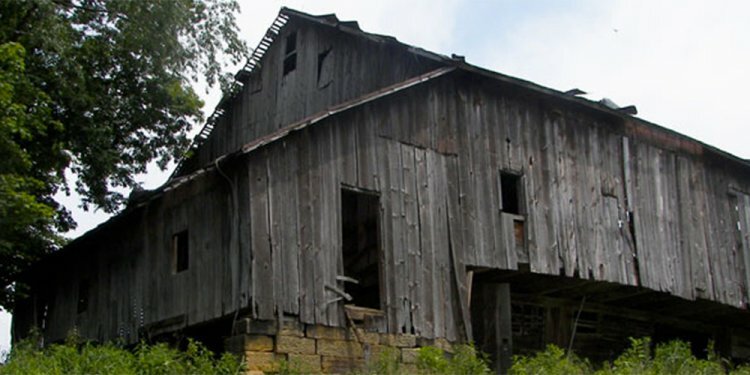 Many old barns have been neglected for several years and even decades. Once the roof of a building starts to go, it doesn't take long for the structure to be in very poor shape. Beams begin to rot, the framing starts to buckle and slip off the foundation and soon you have a very large liability. Insurance companies refuse to insure the barn. The building becomes a huge blight, and it is dangerous to be around it. This is a helpful situation for both the barn owner and yourself. The service you are providing is worth many times over what the wood in the building is worth to the owner of that structure. Many times the first call a farmer or developer will make when they need to dispose of an old barn or building is to an excavation company. This can be a big opportunity for you to pick up some free reclaimed lumber. Let them know that you recycle wood from old barns and buildings. Try to get them to call you before they start a demolition project. This way you can look at the barn before they begin, and possibly go in and reclaim as much wood as you can before they get started. This will appeal to excavation contractors, because they will have less wood to dispose of. They may even allow you to do a complete reclamation. It's a bonus for you because you don't have to dispose of the junk material. Wouldn't it be great if all you had to do to get free reclaimed lumber is drop off a trailer wait a few days and pick it up full of reclaimed wood? You really can do just that! Here is what you need to do. Get in contact with some remodeling contractors in your area. Let them know that you will haul away any wood that they tear out of a house. Contractors will be happy to give the antique building materials to you, it will save them a bunch of money on disposal costs. This works best if you are in an area where there are a lot of old houses. Make sure to let the contractor know that you are recycling the wood, and you take wood only. No drywall, insulation or other debris, only wood, nails are okay if they are in the wood. If it becomes a problem and you are finding a lot of debris, you can start charging a disposal fee. You will get some junk wood and possibly some lumber scraps. It is okay if you do. You can sell the scraps in bundles of campfire wood, or burn it for heat in a wood stove.